Variety may be the spice of life, but when it comes to Humax’s home recording devices it’s consistency that makes them so exciting. You can almost set your watch by the regularity of the company’s digital TV boxes receiving rave reviews here on these pages. This year is no exception. Humax’s latest black box, the FVP-5000T, is set to replace our previous favourite, the HDR-2000T, due to its larger array of features and superb audio-visual performance. At its core, the FVP-5000T offers FreeviewHD+ television. That means subscription-free access to live broadcasts of all Freeview channels – including BBC, ITV, Channel 4, Channel 5 and their various subsidiaries. Though most are in Standard Definition, Humax says that there are 15 channels in Full HD – but that will vary, depending on your location. You can record content too, using an eight-day television guide for scheduling recordings in advance. There’s also the ‘series record’ function, so you don’t have to manually select each episode in a daily or weekly show – let the digital box take care of that automatically. Where the FVP-5000T improves over the HDR-2000T is by offering that same functionality with even greater scope. Instead of being able to record two programmes while watching a third, the FVP-5000T can record four programmes while you watch a fifth. That’s particualrly good news for the content-hungry – and for those power users we’d suggest the 1TB or even 2TB options, at £260/$260 and £300/$300 respectively. We’re testing the 500GB here. can catch up on shows you might have missed. Selecting the previous week’s episode of Great British Menu from the guide, for example, automatically sends you to the BBC iPlayer app. This is much faster than navigating the iPlayer’s menus or using the text search function. The FVP-5000T also offers a greater range of catch-up apps including ITV Hub, All4, Demand 5 and UK TV Player, as well as YouTube and Netflix. You still need a subscription for the latter, and even if you have access to Netflix’s 4K HDR content, the FVP-5000T will only show it in Full HD. The box has built-in wi-fi, but there’s also an ethernet port for a more stable connection. On the back and sides of the box, there are a couple of USB 2.0 ports plus an RCA output. 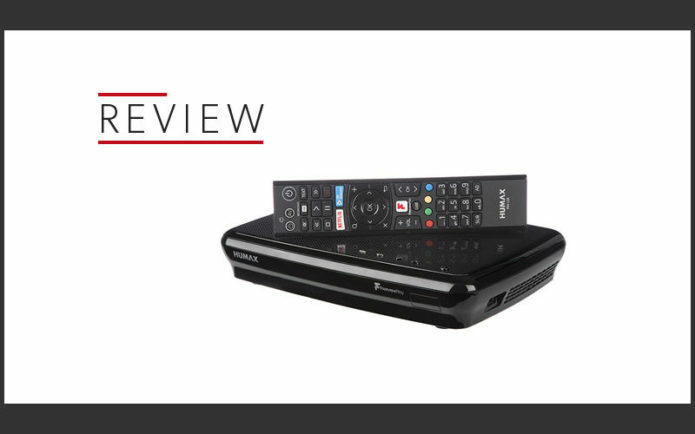 To keep pace with the increased number of options, Humax has given the remote a shake-up too. There are now dedicated quick-access buttons for your recordings, Netflix and On Demand services. While they feel a bit more plasticky than other remotes we’ve used, they are responsive – setting up the box and watching television takes a matter of minutes. On the iOS and Android app stores there are also remote apps so you can use your smartphone to control the box, but using them is a mixed bag. Searching through catch-up services using your phone’s keyboard may be quicker than navigating the buttons, but the process isn’t inherently faster and you’ll still have to to go to the conventional remote to open Netflix or other apps. The box itself is small and sleek, and about as wide as a compact laptop. It can easily sit beneath most televisions – in this case our Samsung QE55Q7F. Flicking the channel over to BBC One to watch Escape to the Country, the FVP-5000T suggests changing to the Full HD version. Clicking ‘OK’ takes us to the High Definition broadcast, and the digital box provides a good quality image. Colours are natural, and there’s a satisfying amount of detail to the endless wood panelling and stone walls. Watch in standard definition and those characteristics remain, despite the expected drop in quality. Ultimately, the FVP-5000T and the HDR-2000T have similar pictures – and they are satisfying, especially if you haven’t yet upgraded your television to 4K. We have few complaints when it comes to sound quality either, with the Humax giving as good a rendition of Taylor Swift’s Look What You Made Me Do on 4Music as we would expect. It’s peppy, relatively insightful and certainly enjoyable. If you need a Full HD box to give your older television a bit more sparkle, Humax’s latest digital box should undoubtedly be something to consider. Its array of channels, apps and intuitive user interface means that even the least TV-savvy among us will be able to use it to great effect.